We are all getting excited here at LTSIG commitee HQ – not an actual office building but an online space called ‘Slack’. 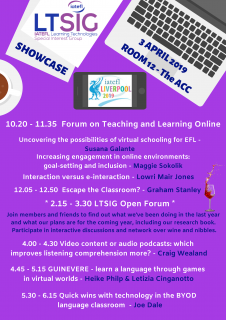 The 53rd IATEFL conference in Liverpool is nearly here and we have lots of great things going on, especially on 1 April – our Pre-Conference Event, which has already been widely promoted and on 3 April. On this latter day, the Wednesday of the conference, we will be showcasing several talks and workshops in room 12 and we share details of those sessions below. Our roving reporter, Serrena Muniz, from Uruguay, will be on hand to capture the event. If you are attending the conference in Liverpool and have not already got the conference app, then there is more information about it on the offical conference website. Interaction versus e-interaction: can you recreate classroom interaction electronically? Language pedagogy has had decades to develop, and Second Language Acquisition is entering its adolescent period, the newest generation of distance learning is in its relative infancy.’ Kraemer (2008) We will explore the idea of recreating classroom interaction electronically. Is this possible? What is digital pedagogy for online interaction, and what are the most efficient means in creating online speakers? Uncovering the possibilities of virtual schooling for EFL Virtual schooling remains a largely unexplored phenomenon restricted to specific subjects despite the emerging need to offer alternative learning environments, accessibility and educational choice. My talk will outline a virtual learning environment built for EFL high school students. The focus will be on ways to tackle a major challenge: active learning within a collaborative learning community in a VLE. Increasing engagement in online environments: goal-setting and inclusion. To increase retention and completion in two ELL MOOCs, research into using goal-setting and statements of inclusion to improve student participation was conducted. While goal-setting was correlated with improved retention and completion rates, statements of inclusion were less effective. This talk looks at the possible reasons for these differences, and ways to make MOOCs more inclusive. After the coffee break, our newsletter editor, Graham Stanley, will run a workshop on escape rooms. This is an adventure game set within a confined space in which players solves puzzles to unlock the door. During this workshop, we will look at how you can best use digital escape rooms for language learning with teenagers and then examine ways you can turn your own classroom into an escape room. An exciting prospect, which Graham first presented about 9 years ago and there is a YouTube playlist for this, too. Needless to say, afterwards you will all need to escape from room 12 in order to have lunch. After lunch, be prepared to re-enter the room, for all Open Forum. You are all invited to this, whether you are members or interested non-members. Find out what we have being doing over the past year and what exciting plans we have in store before the next IATEFL conference. You will have the opportunity to participate in an interactive discussion, hear about our new research book and network over wine and nibbles. In the afternoon, Craig Wealand will present a talk on Video content or audio podcasts. This talk, for both experienced and less-experienced teachers, includes results from a study at the British Council, Valencia on the effectiveness of audio podcasts and video content in improving the listening comprehension of adult learners. Based on the study, the speaker suggests how we might best curate content for adult learner self-study. Following this, our online events organiser, Heike Philp, will present a session on GUINEVERE. This is an EU-funded project, which uses digital game-play for learning a new language in virtual worlds. It has become a popular way of practising a language and is particularly enjoyed by young learners. This session will demonstrate the potential of digital game-based learning in 3D immersive environments in order to improve teaching and learning outcomes. Finally, the day will finish with a quick-fire session from longtime LTSIG collaborator and speaker, Joe Dale. At the 2016 conference, Joe was interviewed about current trends in ELT, while in Glasgow 2018, he was also part of the LTSIG day in a lively session on different apps. This practical session will run through some quick and easy ways of integrating technology into the language classroom, in order to enhance teaching and learning. Joe will show off cross-platform apps for polling students, narrating slideshows, creating text message video conversations, speaking homeworks and using artificial intelligence to promote writing amongst other themes. Be prepared to take part and end the day on an energetic high!